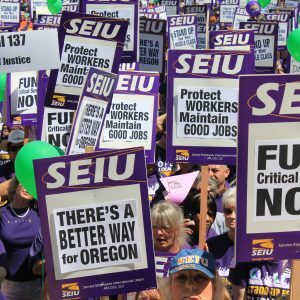 Standing up together to win fair wages, benefits and decent working conditions has historically been the focus of organized labor’s work, but Rob Sisk learned early on that unions have also played a critical role in shaping our society. 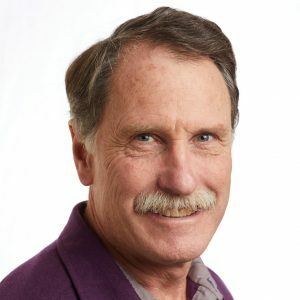 He credits his schooling with giving him so much education on the Labor Movement and laments that subject has diminished so much in curriculums. But Rob also benefitted from his upbringing in a socially responsible family, and counts among his core values the right to a decent life, fair wages, and the dignity and worth of all people. His commitment to the peace movement and social justice relate closely to our Union values and what our members fight for every day. 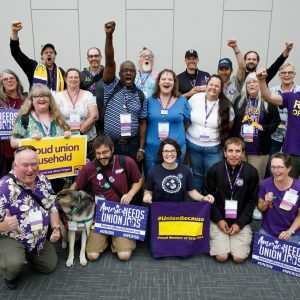 Rob believes SEIU 503 members’ successful efforts to constantly build our membership demonstrate that workers are aware of the importance of unions. 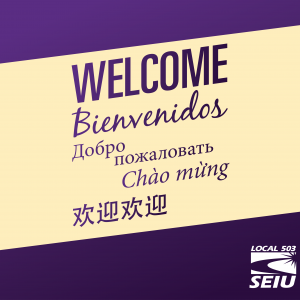 Raising standards for all workers is key to the kind of future we envision and can be achieved through our growth, solidarity and collective action. Rob’s greatest fun comes from witnessing others having fun. A musician-wannabe, he would someday like to finish learning how to play the variety of instruments he has acquired. In addition to writing offbeat western songs that have gone nowhere, Rob also dabbles in offbeat blues songs – some weaving in social justice themes – that mirror the success of his western songs.